If you want to do some shore sea fishing whilst here on holiday we can hook you up. we can hire you the equipment from Ayia Napa, Larnaca, Limassol, Paphos and Polis. comes with 3 floats and line and hook. our trips or even read about them in most of the popular Angling Magazines. and C£25.00 per child (11 years and under). Two to three People C£40.00 per adult and C£30.00 per child (11 years and under). Four + people C£35.00 per adult and C£25.00 per child (11 years and under). This price includes transfers, fishing permits, all fishing equipment, water and a packed lunch. The day starts at approximately 09.00am and you can fish for as long as you want. All you need to bring are yourselves and some sun cream. Just to let you know that in 2005 they caught (and put back) a 36lb Carp. making us the largest and most knowledgeable operators in Cyprus. In 2004 Zak changed his life. He became the wizard of Oz. I was bought my first fishing rod at the age of six and since then became a keen Angler, both coarse and sea. 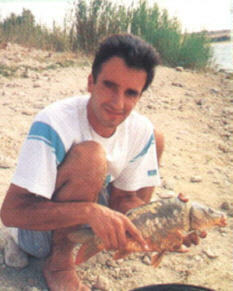 However since coming to Cyprus, I have preferred the Coarse Fishing as it is much more plentiful in Fish. Beware, if you Fish with me I always tend to catch the first Fish. ha ! ha ! improve the fishing conditions and tackle any arising problems. 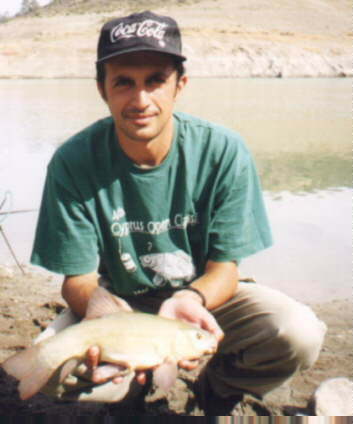 In June 98 River Island organised a day fishing with a number of volunteers. and restock other reservoirs in the coming year. to relocate a number of Carp to tanks in the area. When the water levels rise to normal we will return the carp . and we had daily catches reaching up to 240 lb.s. officers) who helped with the situation on their own time. we are continuously making new proposals to the head of Fisheries. write to us and we would be pleased to forward them to the Fisheries.